A tall growing bamboo to 15 – 20m + Dendrocalamus Maroochy or simply ‘Maroochy Bamboo’ with its green and yellow striated culms it makes a rather striking addition to the bamboo world. Strong growing with a slight weeping habit of the foliage it is also known as ‘Striated Brandisi’. First developed in originated in Maroochydore in Australia it is now grown around the world. 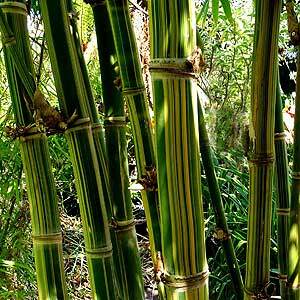 Large diameter culms to 10 cm on mature canes with distinct striping make this an outstanding feature bamboo. Large foliage and lots of shoots, although from a warm climate D. Maroochy will cope with cooler temperatures and does well in Melbourne. Excellent timber variety and new shoots are edible.